Most days my husband and I are like two ships passing in the night, but on one of our rare encounters recently we had a short discussion about fennel. He couldn’t find any when he needed some for a lasagna he made me for my birthday recently. Long story short, he bought some dried fennel, which made me think of a fresh fennel bulb, which I haven’t cooked with in ages. 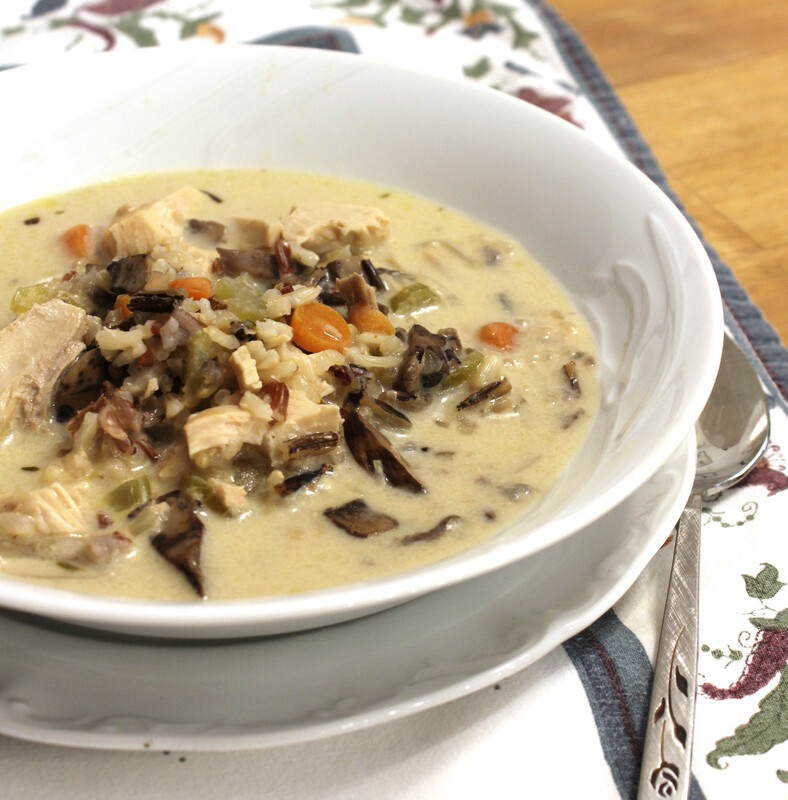 AND SO, I bought a fresh fennel bulb and decided to make this soup with some of our leftover Thanksgiving turkey. And my husband just LOVED this soup! (He had to reheat it since I made it so early in the day.) It has a very guest-worthy flavor with the addition of the fennel and sherry. I hope you enjoy it too! In a Dutch oven or soup pot, melt the butter and oil over medium and add the mushrooms, onion, carrots, fennel, and celery. Cook until the onions and celery are translucent, about 10 minutes. Add the garlic, thyme, rosemary, and bay leaf in the last minute or so. Stir the rice into the vegetable mixture, then add the broth and Worcestershire. Bring to a low boil, then cover and lower the heat and simmer for about 45 minutes until the rice is somewhat tender. Uncover, then add the turkey, sherry and cream or half and half, bring to a low boil again, reduce heat and simmer for another 15 to 20 minutes until the rice is cooked through. Taste for seasoning, and add salt and pepper to taste. I meant to add some fresh parsley at the end, but totally forgot. Feel free to throw that in if you have it! Remove the thyme sprigs and bay leaf, and serve with hot crusty bread. I have been wanting to try my hand at homemade tomato soup for years, especially since we grow and can our own tomatoes. When my friend Suzanne over at Pug in the Kitchen posted this recipe, I knew it was time. 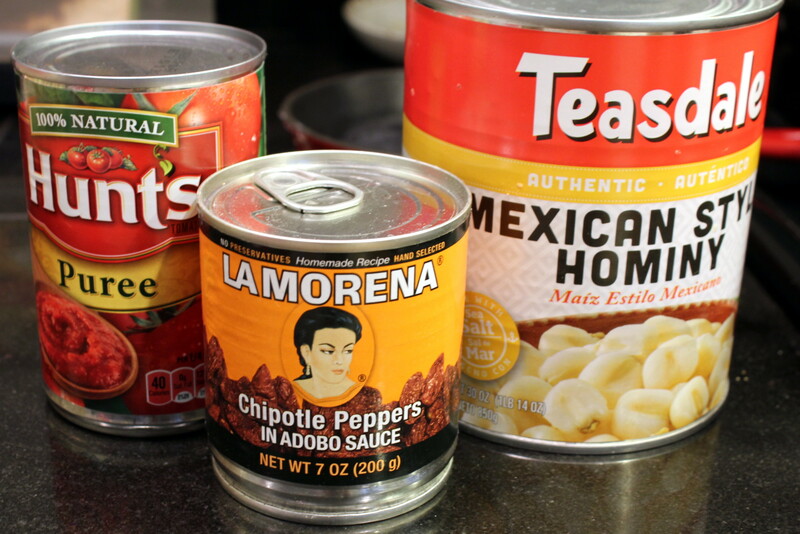 Besides, I had a can of San Marzano tomatoes that had been in my pantry over a year, and what about those 20 pints of canned jars of tomatoes I forgot about in the garage? How did I forget about canning those from the fall? I grabbed a few for my pantry lest I forget again. My husband was amazed at the taste of this soup. According to him, it did not taste like tomato soup from a can. Errrmmm… We’ll leave it at that. Oh, and don’t forget to cook up some ooey-gooey grilled cheese sammies for dunking! We used sourdough bread and a combination of Monterrey jack, sharp yellow cheddar, and pepper jack that was leftover from Super Bowl. This makes about 3 to 4 dinner-size servings. Preheat oven to 450 degrees. 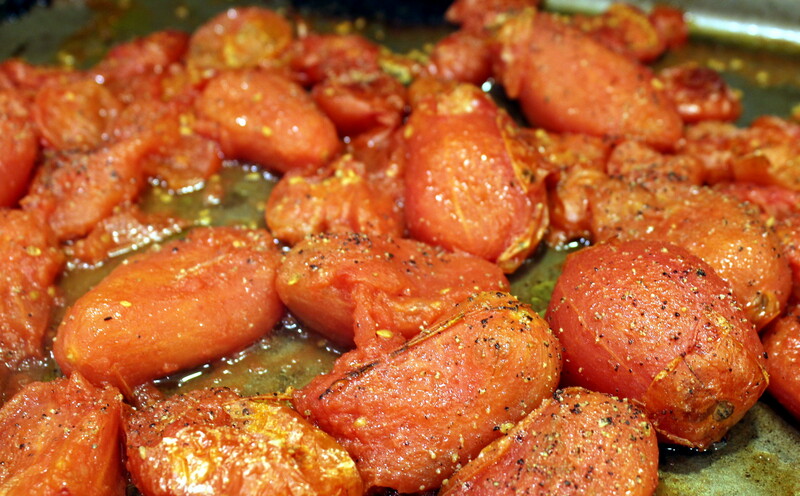 Place all the drained tomatoes on a rimmed baking sheet and drizzle with oil. Season to taste with ground black pepper and sea salt. Roast until caramelized or until your smoke alarm goes off (18 to 20 minutes). 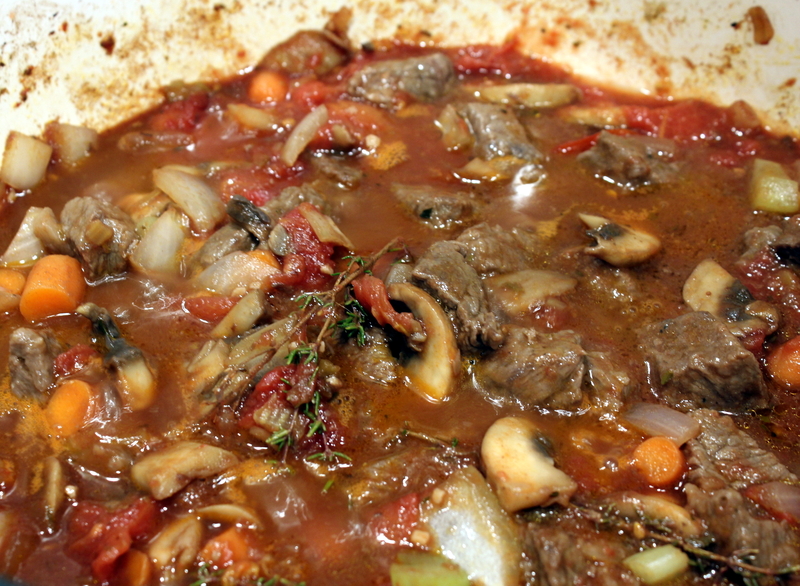 Heat about a tablespoon of oil in a soup pot or Dutch oven over medium heat. 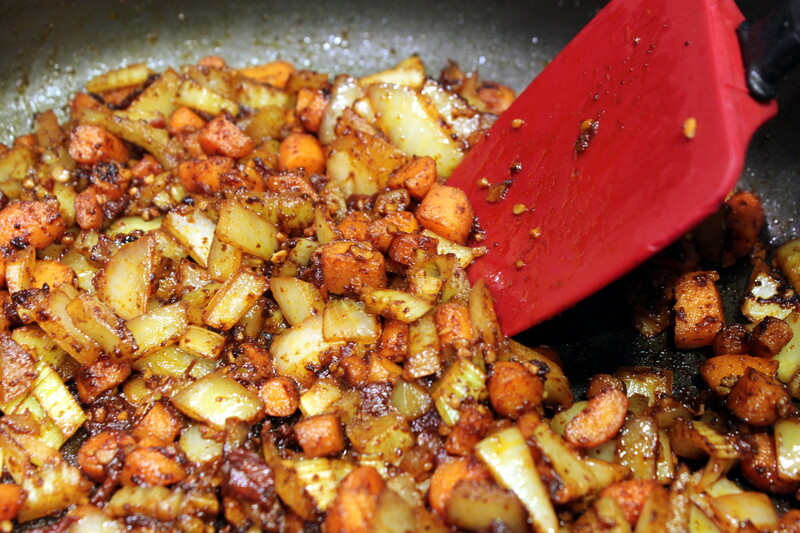 Add the celery, carrot, and onion and cook until they start to soften, about 10 minutes. Add the minced garlic and cook about a minute more until fragrant. Add the roasted tomatoes and the reserved tomato juice (About 2 cups, add water if you don’t have that much. My canned tomatoes had a lot of of liquid.) Also add the bay leaf and cheese rind. 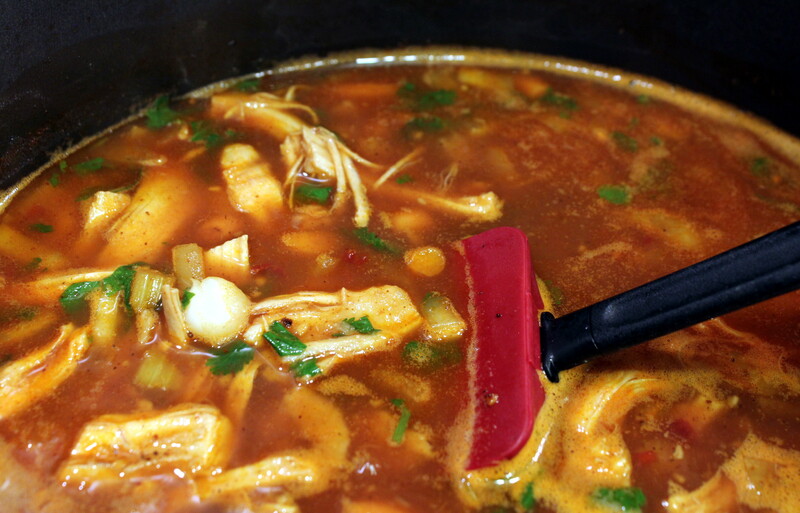 Bring to a simmer and cook for about 30 minutes until vegetables are very tender. Remove the bay leaf, then add the chopped basil. Taste for seasoning. Pour into a large blender and puree until smooth (or use an immersion blender if you have one. I need one!) Return soup to the pot, then add the butter and cream and stir until incorporated. Keep warm while you griddle up some grilled cheese. 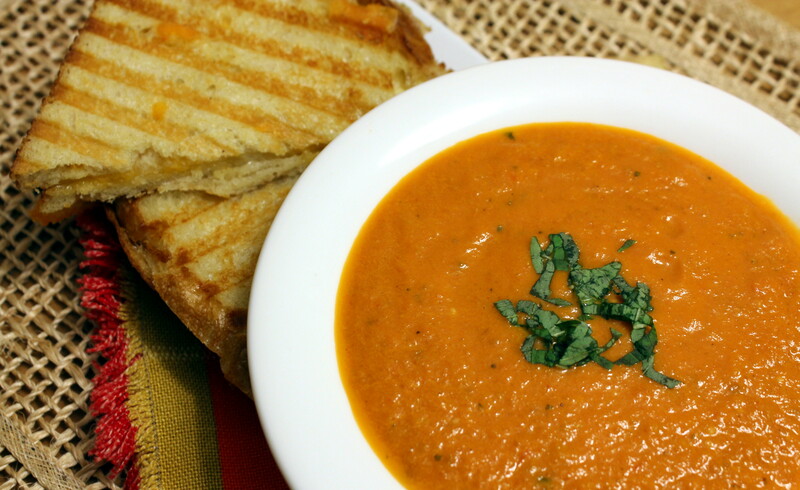 Ladle into bowls, top with additional basil, and serve immediately with grilled cheese sandwiches. Spring has been on a springboard in my neck of the woods in terms of temperature. While it is now seasonably cool, we had a great stretch of really warm and sunny weather for the last week. 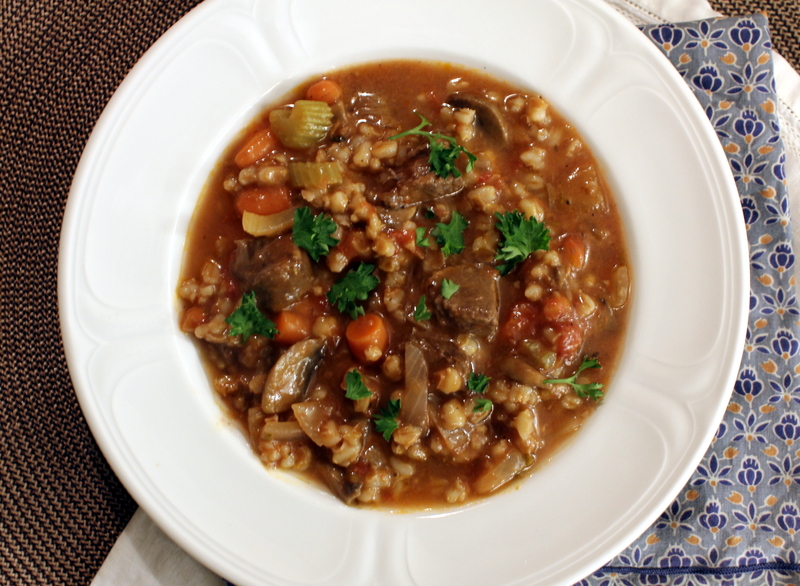 With cooler weather, there is nothing better than a hot bowl of comforting soup. And with leftover ham and ham broth in the freezer, this meal was a snap! After I took my photos, hubs and I both decided we wanted it creamier so I processed half of it in my Ninja then stirred it back in. This step is optional, and I didn’t even take another photo of it creamy that way as I can be lazy that way. 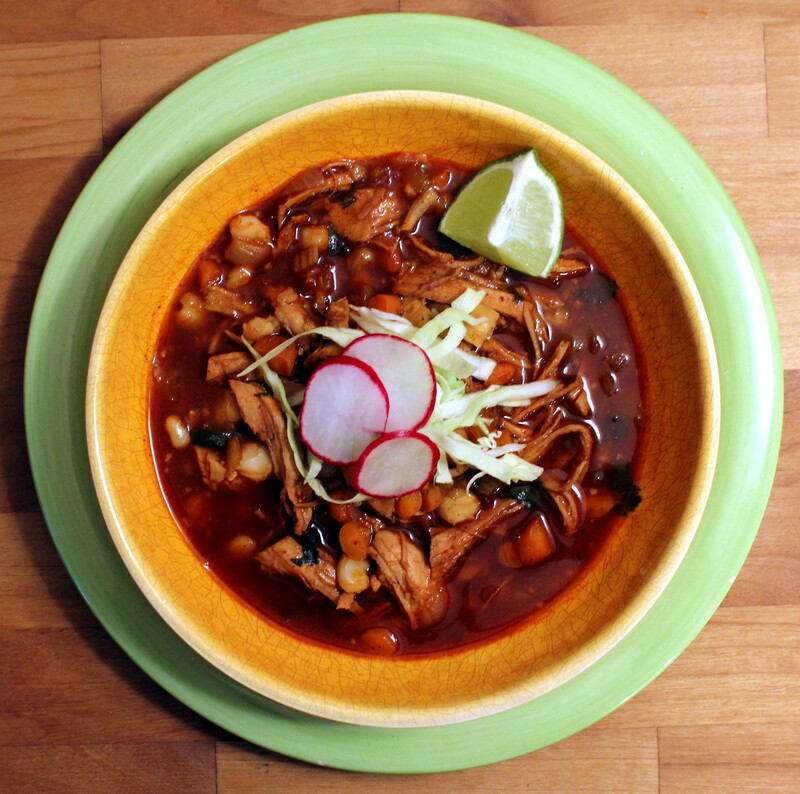 Just like you can be lazy in making this soup as it’s that easy! Saute the veggies in the oil until soft, 5 to 7 minutes. Add the ham, garlic and spices and cook 2 to 3 minutes more. Pour in the ham broth and beans. Add the rest of the seasonings, and taste to adjust. Simmer for about a half hour or more until ready to eat. 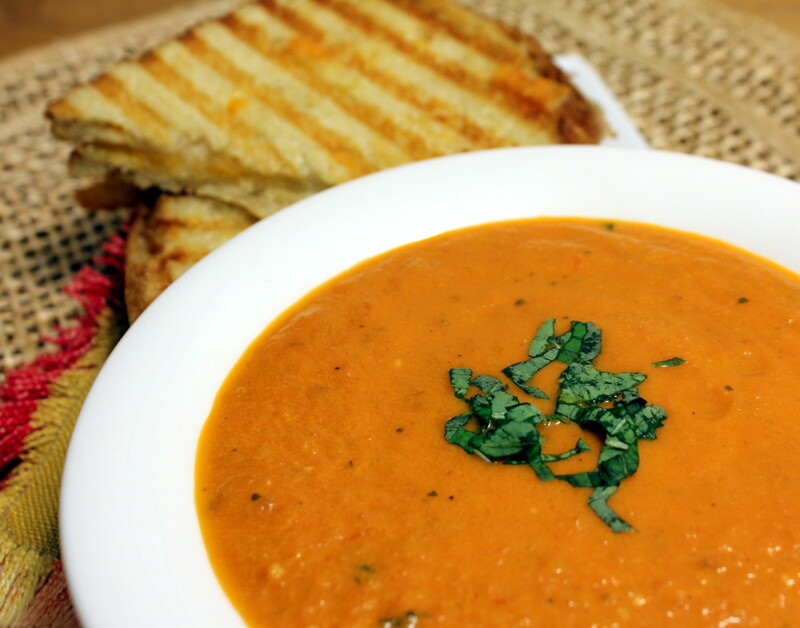 Optional: Puree half the soup in a blender or processor and stir back in before serving. This is a recipe I have made since college repeatedly. Surprisingly, I have never posted it as it is just “one of those meals” in my rotation. When both hubs and I stare at each other after a long day at work with those glazed eyes and say “what’s for dinner,” this recipe is usually one that comes up in the replies. 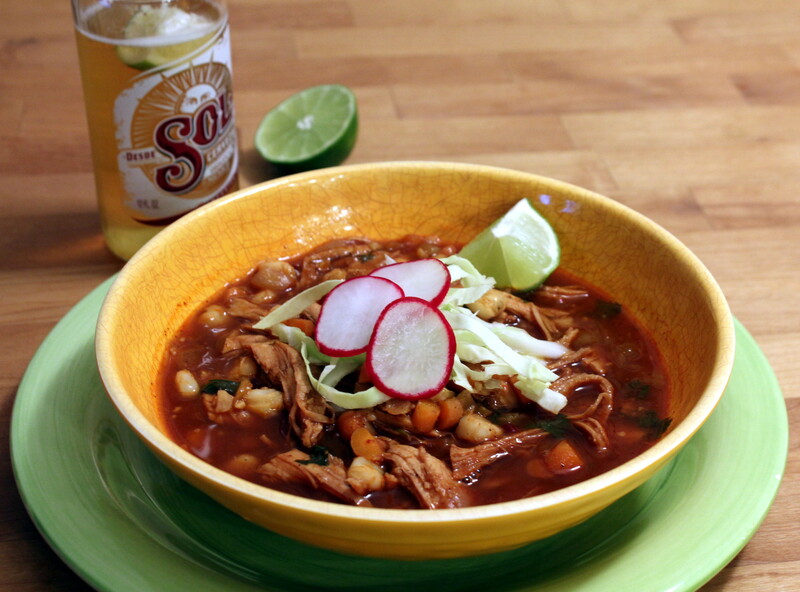 Back in the college days (and even early married days) I used to make this with that canned “cream of” soup. Any flavor I pretty much had on hand. After the hubby got diagnosed with high blood pressure, that was the first thing out the door. So I learned how to make my own “cream of” soups, and it is surprisingly simple! (And certainly healthier too but it does have butter and flour.) But never mind that. It just TASTES better too! It’s a plate full of comfort, I tell you! We typically serve with a small salad or steamed green veggie on the side. 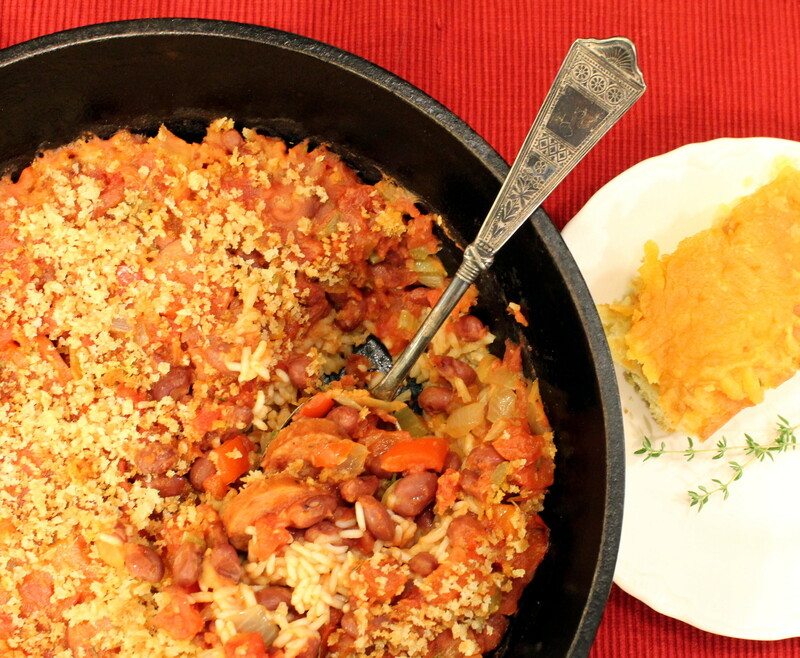 This can make enough for anywhere from 2 to 6 people, if you have a large enough skillet. I had some huge pork chops, so depending on your family’s eating habits you’ll have leftovers, or not. Don’t worry about the amount of “soup” you end up with, there’s always enough creamy sauce for the amount of meat, potatoes and onions, even if it looks sketchy at best at first. No lie! p.s. I originally called this simple and easy, but after looking at all the steps after writing it up, I realized I only “think” of it that way, as I swear I could make this blindfolded! If you make this enough times (as I hope you will) then I think you’ll feel the same! First thing to do is get out the mandoline and slice up all those potatooties and onions thinly. If you don’t have a fancy (like 9.99 Walmart or Amazon) device, then slice thin with your sharpest knife. It’s OK if you don’t have a mandoline. I’m a newcomer to that game and scoffed until I bought one. I totally get it. Cut the onion rings in half with a knife (optional). Next season up those chops nice and good, however you want. Nobody is judging you on your spice preference. Add a tablespoon or so of oil to a large hot skillet (that has a cover to fit) and sear the pork on each side, until nice and browned. I forget how long that takes as I just eyeball it. A few minutes each side, at least. Once browned, remove the chops to a plate, cover with foil, and set aside. Add more oil to the skillet and toss in the sliced potatoes and onions and lower heat to medium. Season, to taste. Cook for about 5 to 7 minutes or so, stirring here and again. Meanwhile, make your “cream” of soup. The pans will be side by side, you can do it! I had ‘shrooms on hand that day, so cream of mushroom soup it was! I also used some turkey stock from my Thanksgiving batch of carcass stock. Melt the butter in a small sauce pan over medium-high heat. Add your “of” ingredient (in my case the mushrooms) and cook until soft and the butter is foaming. Pre-cooked chicken is not such a big deal to worry about softening. Add the flour then whisk until it’s all incorporated and turns into a weird paste. That’s OK too, it’s supposed to do that. Add the stock all at once, then whisk like a whirling dervish until it’s all incorporated and smooth and creamy. Strange how it suddenly happens, huh? You’ll know after you try it. Then add the milk and whisk some more until it’s all combined and creamy again. Once again, season to taste and stir in. Turn off heat and set aside. Now. Now is the time to put it all together. 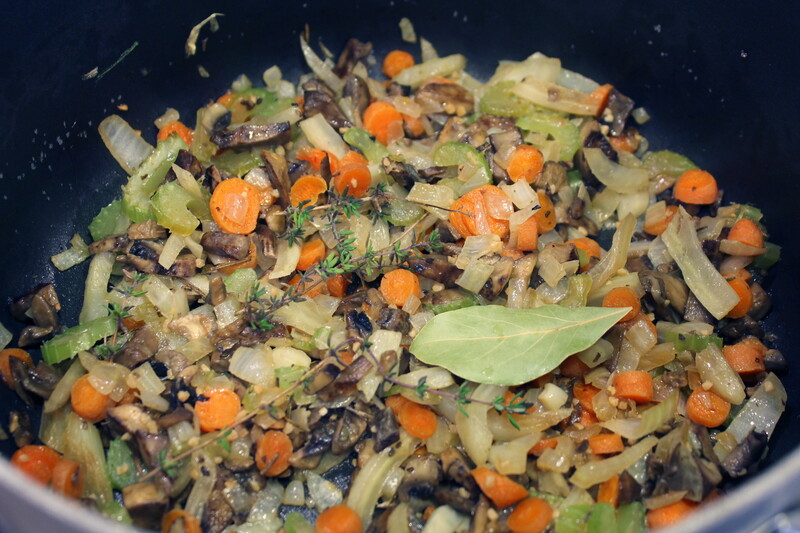 Deglaze the skillet of veggies with wine or more stock or water to loosen up the yummy crispy bits. Place the browned pork on top of the potatoes and onions.Pour the cream “of” soup over the pork and spread around. Sprinkle your preferred herbs over top. Please, do not freak out at this point that you don’t have enough soup or gravy or whatever. Trust me. See my photo? Bring the skillet up to a slow simmer, then cover, and turn down to medium low. Then walk away. WALK AWAY! Leave it alone for 20 minutes. After 20 minutes, uncover and smoosh everything down into the gravy because OMG where did all that gravy come from??? Ha, told you so. This photo is only after 20 minutes. Cover the skillet again, and cook until the potatoes are tender and the pork is at least 145 or more degrees, anywhere from 10 to 20 more minutes depending on the thickness of the chops and potatoes. Once potatoes are softened and pork is safe to eat, turn off skillet, cut pork into serving sizes and scoop amount of potatoes and onions and gravy on to your plate that you want. Serve with some kind of green veggie or salad or whatnot. Enjoy! Yay, a new recipe! And of course it is a soup recipe made with some of the turkey stock I cooked last week. I also had some dried green lentils left from the last soup I made (wow was that a month ago? ), as well as some leftover cooked brown rice in the fridge begging to be used up. 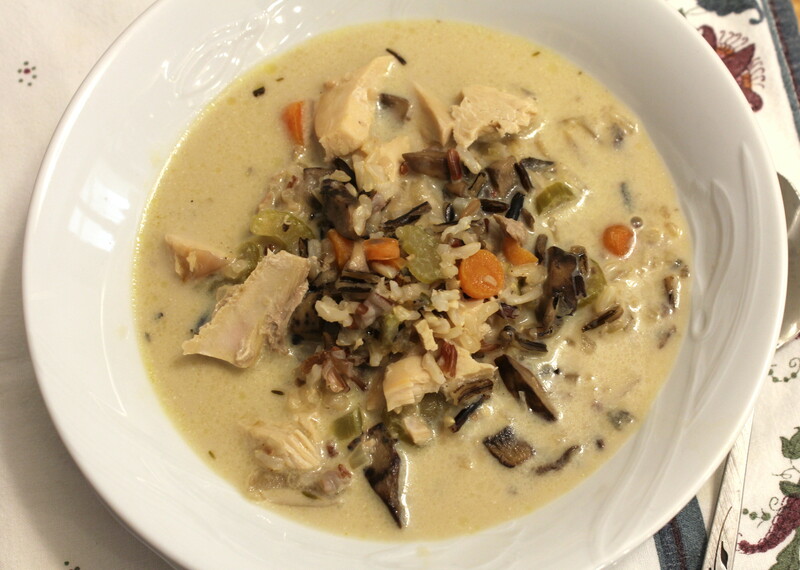 We had also frozen the leftover turkey breast from Thanksgiving, so this soup ended up being not only a no-brainer, but a deliciously wonderful and frugal dinner. In a Dutch oven or soup pot, melt the butter over medium high heat. Add the onions, carrots, and celery and cook until the vegetables are starting to soften, about 7 to 10 minutes. Add the garlic and cook a minute more. Next add in the turkey (or chicken) stock, bay leaf, thyme, and lentils. If using dried rice, add that now too. Cover and bring to a boil. 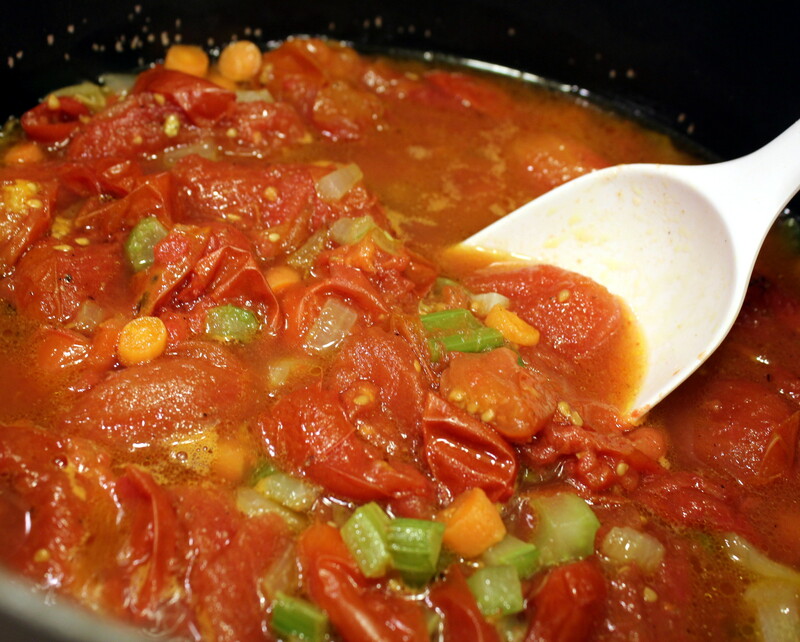 Once boiling, reduce heat to low and simmer with cover on for 45 minutes. 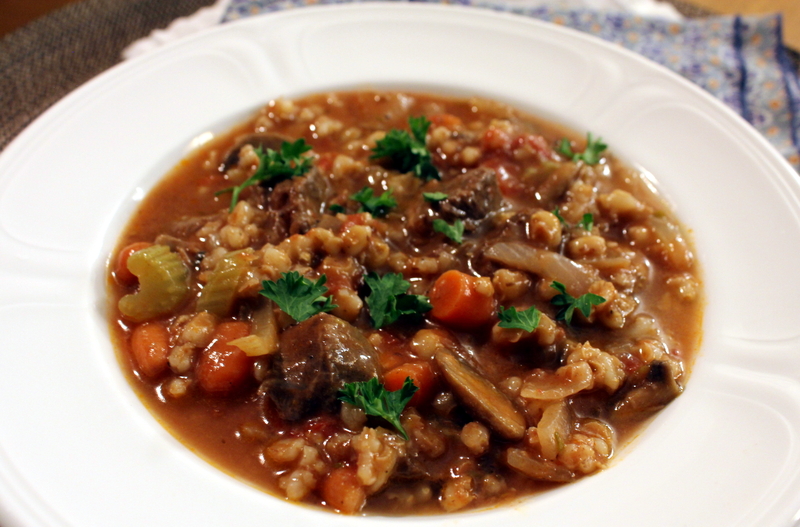 Uncover and stir in turkey and cooked rice, and continue simmering until lentils are tender, about 15 more minutes. Remove the bay leaf and thyme sprigs, then add the parsley and balsamic vinegar. Taste test, then add ground pepper and Mrs. Dash or salt, to taste. Serve with crusty bread. I probably sound like a broken record, but I LOVE SOUP SEASON! A few weeks ago I grabbed the rest of the beef marrow bones out of the freezer and decided to make a huge pot of beef bone soup stock. We have a new quarter side of beef on the way for our freezer and it was way past due to finish using those up. After that task was accomplished, of course I had to make some soup out of that rich, golden broth. Our grass-fed ground beef from last year was long gone, but my hubby bought a fancy electric meat grinder and he ground up a bunch of chuck and made 3/4-pound bags for the freezer. That amount makes so much more sense for our family than a pound since there are only three of us. Also out of the freezer came some frozen tomatoes from our harvest. All I had to do was run hot water over them and the skins slipped right off! 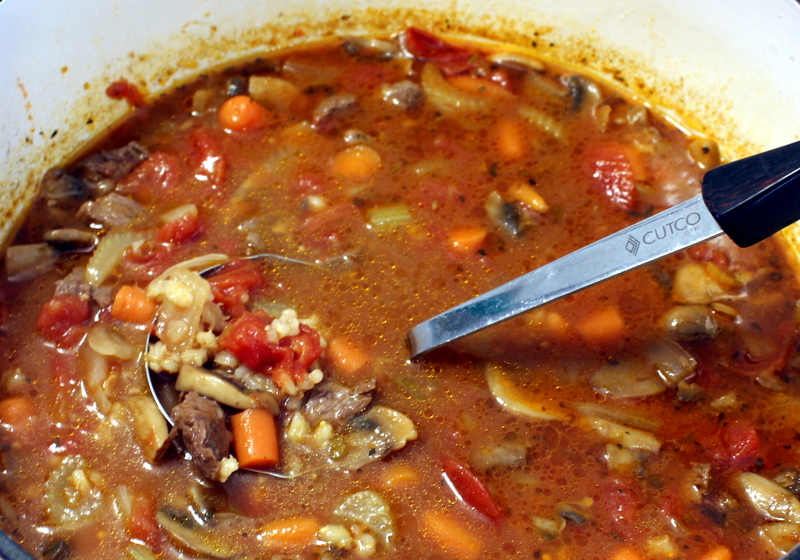 Add the ground beef, onion, carrots, and celery in a large soup pot or Dutch oven. In this case I used my pressure cooker pot. (Stay tuned, confession time coming!) Cook over medium heat and stir until meat is brown and vegetables are starting to soften. Add the garlic and cook a minute more. Next add the tomatoes (I crushed them with my hands when adding them) plus the liquid, the beef broth, lentils, oregano, and sugar. (The small amount of sugar offsets the acidity in the tomatoes.) Stir to combine. CONFESSION TIME: At this point, I honestly do not remember if I actually pressure cooked this or just finished simmering uncovered. Really! 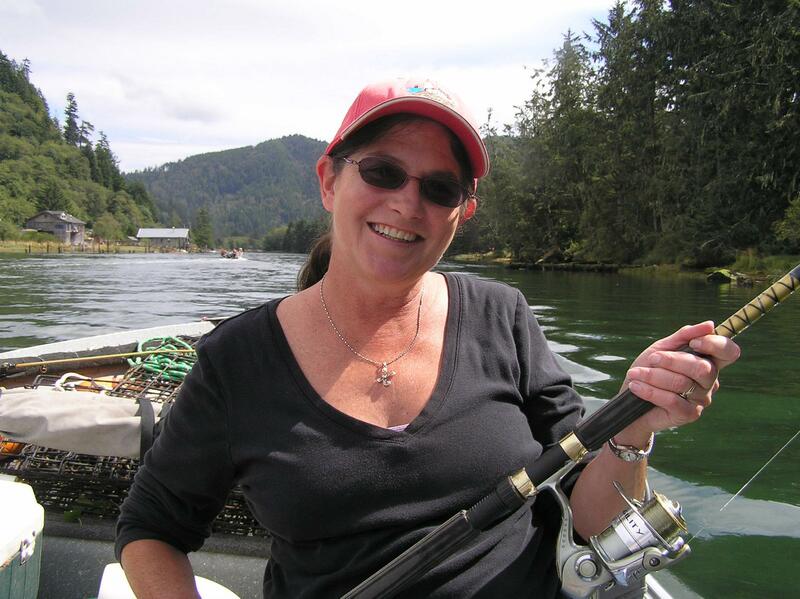 I know I used my pressure cooker pot from the photos. Did I use it because I intended on pressure cooking the lentils, or did I use it because all my other large pots were used up from making the beef stock earlier in the day? This was only a few weekends ago! Please don’t laugh at me, laugh WITH me! Nonetheless, either pressure-cook this for 20 minutes, or simmer it uncovered for about an hour. After the lentils are soft, add in the chopped spinach and stir until wilted. Taste test, then add sea salt and ground pepper, to taste. I thought the soup needed just a tad more flavor boost, so added a couple of teaspoons of balsamic vinegar. Perfect. Soup’s on! Serve with crusty bread.